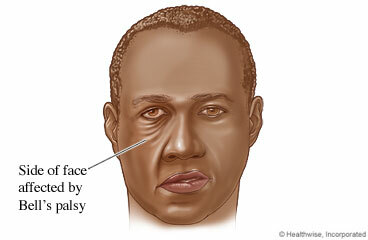 Bell's palsy is paralysis or weakness of the muscles on one side of the face. Often people with Bell's palsy have a droop on one side of the mouth and have trouble completely shutting the eye on the same side. Bell's palsy can also interfere with the sense of taste. These things happen when a nerve in your face becomes inflamed. Bell's palsy is not caused by a stroke. The cause of the nerve inflammation is not known. But some experts think that a virus may cause it. Because of this, doctors sometimes prescribe antiviral medicine to treat it. You also may get medicine to reduce swelling. Bell's palsy usually gets better on its own in a few weeks or months. Take your medicines exactly as prescribed. Call your doctor or nurse call line if you think you are having a problem with your medicine. You will get more details on the specific medicines your doctor prescribes. Use artificial tears or ointment if your eyes are too dry. Bell's palsy can make your lower eyelid droop, causing a dry eye. If you cannot completely close your eye, consider using an eye patch while you sleep. Help yourself blink by using your finger to close and open your eyelid. This may help keep your eye moist. Wear glasses or goggles to keep dust and dirt out of your eye. As feeling comes back to your face, massage your forehead, cheeks, and lips. Massage may make the muscles in your face stronger. Brush and floss your teeth often to help prevent tooth decay. Bell's palsy can dry up the spit on one side of your mouth. This increases the risk of tooth decay. You have numbness or weakness that spreads beyond one side of your face. You have a skin rash or eye pain or redness, or light bothers your eyes. You have a new or worse headache. Enter P168 in the search box to learn more about "Bell's Palsy: Care Instructions".